Like many technological products meant to improve day-to-day life, bathroom fans suffer from the oldest problem: they aren’t turned on. 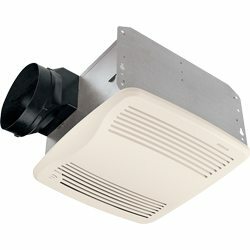 Ventilator manufacturers have developed bath ventilation systems that take the guesswork out of reducing humidity and keeping bathrooms properly ventilated. Since moisture reduction is the goal of bathroom ventilation, a fan with a built-in moisture sensor is an excellent choice. 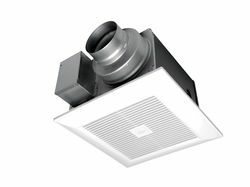 Broan’s QT Series Humidity Sensing Fans with Sensair® Technology offer ducted ceiling fan models with options of light, night lights and 4” and 6” duct requirements. The humidity sensor turns the fan on automatically when moisture is sensed and the automatic turn off time can be adjusted from 5 to 60 minutes. The fan is extremely quiet, at 0.7 sones, about as quiet as leaves in the wind. Panasonic offers a single WhisperGreen Select Fan (left) with more than 250 different configurations using four modules that can add custom features. The first module offers built-in Pick a Flow Speed Technology allows different speeds of 50-80-110 or 110-130-150 cubic feet per minute (CPM) with the flip of a switch. Other modules can customize the fan with multi-speed functions, moisture and/or motion sensor and nightlight. The modules are easy to add and just snap in. Both products are Energy Star® certified.